Over the past couple of years, Strikeforce has managed to compile the deepest middleweight division in all of MMA. With their current talent pool at 185, look for the promotion to put on some blockbuster bouts. In case you didn’t notice, three of the fighters that he mentioned were brought over via their acquisition of ProElite’s assets earlier this year. Although the deal helped solidify their middleweight division, Strikeforce is more anxious about getting their own champ back in the cage. When he finally comes back, Afromowitz already has an opponent lined up for him. “The rematch that everyone wants to see is Frank against Cung, and I think that should be Cung’s first fight back,” stated Afromowitz. Interestingly, Afromowitz wasn’t as eager to unify the 185-pound title by having Le and former EliteXC champ Lawler slug it out in a 5Round affair. Although that bout isn’t in the organization’s immediate future, they know that they struck gold by obtaining a fighter of Lawler’s skills and they have all intentions of using him. 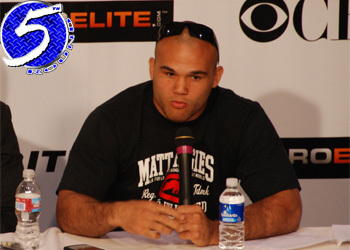 “I think he can fight any of our middleweights,” Afromowitz said about Lawler.